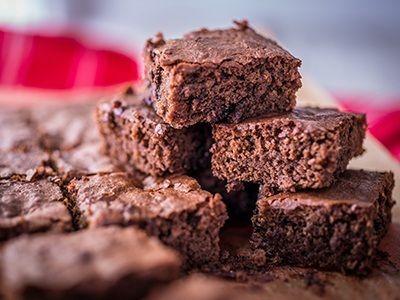 A rich and decadent chocolate brownie recipe is one that every baker should add to their repertoire. Our delicious chocolate brownies are a real treat for chocolate lovers, and they’re brilliant to have on hand when guests visit too! The recipe below combines a rich chocolate filling with delicious dark chocolate for a delectable dessert. 1. Preheat the oven to 180°C (160°C for fan ovens) or Gas Mark 4. Scoop the Carnation Caramel and 200g of the chopped chocolate into a microwavable bowl and heat on full power for 1 minute until just melted, stirring halfway through. Pour in the oil and sugar and mix well. Fold through the self raising flour and then add the eggs. Stir into a smooth glossy consistency then tip in the remaining chopped chocolate. Mix well and pour into a lined baking tray. 3. Place in the centre of the oven and bake for 35-45 minutes until firm to the touch and a good crust has formed. Try something different with the chocolate brownies recipe and add 150g of chopped walnuts. Have you tried making this delicious recipe yet? Let us know by clicking ‘I made it!’, or give us your tips and tricks on the discussion board. Just to revise: made these using 20cmx20cm tin and half dark and light muscovado. Cutting into mini bites approx 1.5 cm I can get 36 portions, they are lovely with a dusting of icing sugar. Will try with all dark muscovado next time. Chocolate Brownies Recipe is rated 4.0 out of 5 by 4. Rated 5 out of 5 by Lulu from Brownies Was making tablet and opened by mistakes tin of caramel instead of condensed milk so thought I would look for a recipe to use up the caramel I opened. Amazing result was eaten up before I could take a photo , everyone loved the Brownies , so easy to make . Rated 1 out of 5 by JJT 12 from Chocolate brownie I made this today, used a 21cm tin. Followed the recipe and after 50 minutes in the oven the thick crust was black and the middle was still not cooked, it sank in the middle. Please can you advise me what size of tin to use.